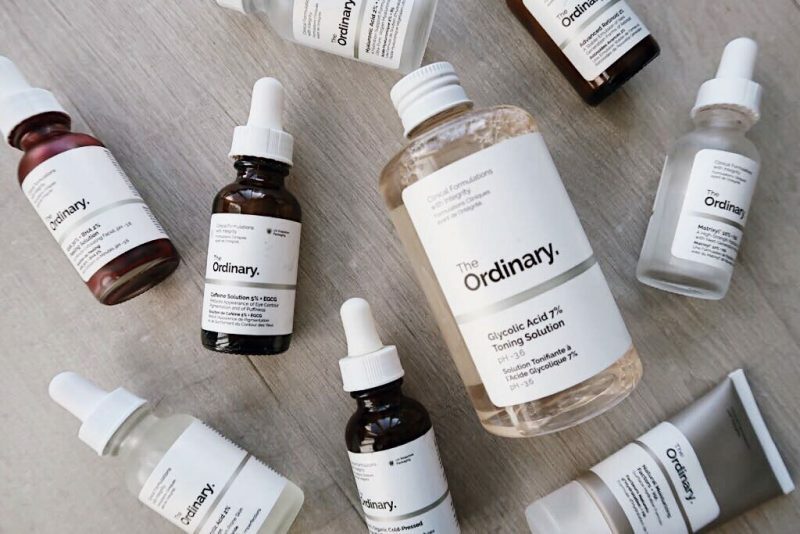 We managed to empty the stockroom within days of launching The Ordinary’s first products, sending us all crazy asking the question “how the bloody hell can they sell concentrated skincare for that price?” I was almost in disbelief that I sent an email to the company asking if it was real and just temporary test or was it a permanent brand. After never hearing back (!) I decided to answer my own question and worked my way through the products seeking what is good and what isn’t. What is the ordinary all about? Concentrated or active ingredients means the product has high levels of natural vitamins or acids, allowing the ingredient to penetrate the skin on a deeper level giving you instant results and healthier more youthful skin. These days we are well educated into these grey areas of the beauty world that it’s normal to reach for an acid based serum or lotion, rather then waiting for your next facial appointment to get that hit of glowing skin back…all for a super affordable price! The smart thinkers of The Ordinary have produced a ground breaking brand that allows us all to have great skin for under £10 (officially the cheapest products on the market!) they have taken familiar, effective and well-studied ingredients into cute pots, and sold at an honourable price…something of which we really appreciate! AHA 30% + BHA 2% – For most skin types (not sensitive) a patch test is recommended. This is a product I would advise you use sparingly – one pipet full once a week or every other & leave on for a maximum of 10 minutes then remove using a warm flannel. Take caution when using at home as high percentage peels can cause skin burns when used too often or left on for too long. It contains strong Glycolic/Lactic/Tartaric/Citric/Salicylic and Hyaluronic Acid, it works immediately on the surface of your skin, to lift and remove dead skin cells and help to even texture and smooth the skins surface. I absolutely adore this product and the result after use is amazing, there are a few similar options available on the market that are much simpler and safer for you to use at home. Remember daily SPF 50+ is essential when using acids on the skin. Hyaluronic Acid 2% + B5 – This little gem can hold up to 1000 times its own weight in water! Which means hydration levels are on the up for anyone using a Hyaluronic product. Ideally each one of you reading this should be investing in this product right now, it’s cheap as chips and worth its weight ten times over! It is suitable for all skin types needing a little help – dehydration, dry, combination, ageing and even oily skins need a boost of hyaluronic acid. This natural ingredient is found within our skin layers but unfortunately depletes with age, it is highly recommended that we all use such a product to top your natural hyaluronic acid levels and enhance the skins ability to retain water. Apply one or two pipet full twice daily before your day and night creams. Caffeine Solution 5% EGCG – The caffeine addiction continues in skincare too! Think eye contour, shadowing and overnight puffiness.. this UV protected serum contains 5% concentrated caffeine and EGCG in English terms is from green tea leaves, therefore antioxidants are present. I much prefer to use a serum around my eye area as opposed to creams (I don’t like to overload my eye area with product) so this is perfect to brighten and help to reduce puffiness (my own opinion) it won’t help unfortunately with permanent dark or puffy issues (medical advice will be needed) but it’s a great pick me up and i pop mine in the fridge ten mins before I use half a pipet in the morning to brighten my eyes. 100% Organic Cold-Pressed Rose Hip Seed Oil – I am very much into oils, facial oils, body oils, essential oils … basically anything oil! Oils carry smaller molecules so they are able to penetrate the skin in a way that cream and lotions can’t. This pure unrefined organic Rose Hip oil carries high levels of Omegas 3&6 which work to deeply nourish the skin with essential fatty acids. Pro-Vitamin A targets signs of ageing and strengthens the skins protective layer, this is a super lightweight non-greasy consistency can be mixed into your day or night creams as a hydration booster or on its own as your overnight repair oil. We should all be sleeping in a facial oil no matter what your skin type is as it’s light molecules allow our skin to breathe while we rejuvenate during the night. Granactive Retinoid 2% Emulsion previously known as (Advanced Retinoid 2%) – Retinol is by far the best ingredient to fight ageing signs and help speed up our skin cell turn over, our skin rejuvenates every 3-4 weeks whilst in your 20s – 30s, however when we hit 40s/50s they slow up to every 45 to 90 days meaning we will hold onto damaged and dead skin cells on the surface of our skin. You may of also seen a few other versions of Retinoid such as Retinol & Vitamin A. They are very similar as they carry the same key ingredient (Retinol) however they differ because of the add on Ingredient that makes them less aggressive on the skin and Vitamin A can also be found in drink or supplement form. This non-prescription product in particular is a highly advanced form as it contains two forms of Retinoid rather then just one and it has shown to deliver higher class results in the effects of the ageing process. Retinoid’s job is to target signs of ageing (fine lines, pigmentation, wrinkles, dull flat skin conditions) and deliver a concentrated form of Retinol without irritation. Use one pipet before bed on clean skin and leave alone with no night oils or creams for a stronger hit or apply your night oil to weaken the strength a little, use every other night for two – four weeks then take a break. It’s highly recommended that you treat this process as trial and error to see what does and doesn’t work for your skin. Not everyone is the same and each product will deliver individual results depending on your age, skin condition, diet and correct Retinoid choice. SPF daily is essential when using any acids or retinol materials as they break down the surface of your skin allowing a fresh new layer to appear, meaning UVA & UVB rays will hit the new skin hard causing further damage. 50+ face SPF is recommended. Matrixyl 10% + HA – This is a peptide composition serum meaning it’s combined active ingredient forms a super hydrating formula. The delivery system is aimed at reducing fine lines and dynamic wrinkles already showing on the skin, in other words plumping fine lines and wrinkles via the Matrixyl 3000 and tripeptide-38 followed by a hydrating boost from the trusty Hyaluronic acid. A non scary anti-ageing serum ideal for 30+ ages. Use each morning before your day cream and evening before your retinol or facial oils. Natural Moisturising Factors + HA – The Ordinary have cleverly taken natural hydration compounds that are already found in our skin. This is one of my favourite day creams because of its simplicity, especially those days when my skin is playing up and I can only apply non fragrant emulsion and less is more at this point to allow my skins PH to balance itself out. This is ideal for dry and dehydrated conditions, containing not one or two amino acids… but 11! Alongside glycerin, fatty acids and Hyaluronic acid blended to enhance your skins protection and prevent moisture loss. This white cream is surprisingly light and non greasy which means combination and oily skins needing a top up of nourishment can also get a dab in this tube too. Always order a few as the packaging is very small and it doesn’t last long. Apply at the end as your day cream right before your makeup. Vitamin C Suspension 23% + HA 2% – Antioxidant power at its best! This year we will see a huge rise in Vitamin C users, coming straight from the Korean obsession of using a product that not only works to relieve their skin of pollution but also brighten and smooth your complexion when applied topically. This particular option of Vitamin C does give you a slight tingling sensation as it’s strong gritty consistency takes a few moments to settle, ideally used at night for these reasons before your night oil or even mixed in with your facial oils and serums if you wish (not on the same night as retinol) if you don’t get on with the consistency of this product then opt for the Vitamin C Suspension 30% in Silicone. Keep up-to date with Michaella Bolder, get insights into industry secrets, exclusive offers & Michaella's happenings.